A man is detained after trying to hit Finnish Foreign Minister Timo Soini at the Korson Maalaismarkkinat country fair in Vantaa, Finland March 24, 2019. Lehtikuva/Heikki Saukkomaa via REUTERS ATTENTION EDITORS - THIS IMAGE WAS PROVIDED BY A THIRD PARTY. NO THIRD PARTY SALES. NOT FOR USE BY REUTERS THIRD PARTY DISTRIBUTORS. FINLAND OUT. NO COMMERCIAL OR EDITORIAL SALES IN FINLAND. (Reuters) - A man wearing the logo of a right-wing anti-immigration group threatened Finland's foreign minister at an election rally on Sunday, but was quickly restrained. Shocked but unhurt, Timo Soini thanked police for quickly stopping the man, who was wearing a black shirt from the Soldiers of Odin group - named for a Viking god. "Today, there was a terrible incident that nobody wanted or hoped for," Soini said on his blog after the events at the Korso market in the southern Finnish town of Vantaa. "I thank security guards for their good work," he added. Finland is due to hold parliamentary elections on April 14. Police said "an aggressive and threatening" man had approached the minister, before being bundled to the ground. There was no indication he was armed. Reuters was unable to contact the Soldiers of Odin, a group founded in 2015 during a wave of immigration to Europe. The incident drew swift condemnation from the government. "An attack on democracy is unacceptable. Political violence should not be accepted. We must work together to defend our valuable common democracy," tweeted Prime Minister Juha Sipila. 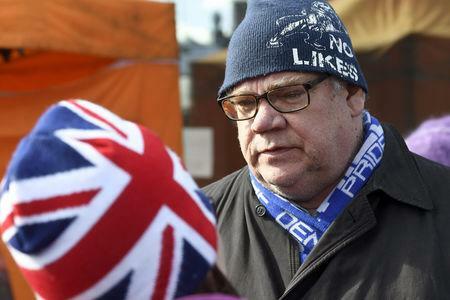 Soini in 2017 broke with the populist Finns Party, which opposes immigration and membership of the European Union, opting instead to lead a new conservative party, Blue Reform. Ahead of the April vote, Sipila's centre-right coalition resigned earlier this month over failed healthcare reforms, though the cabinet stayed in a caretaker role. Opinion polls show the opposition Social Democrats lead a crowded field of parties.